Very well packed in polystyrene and a webbing strap. 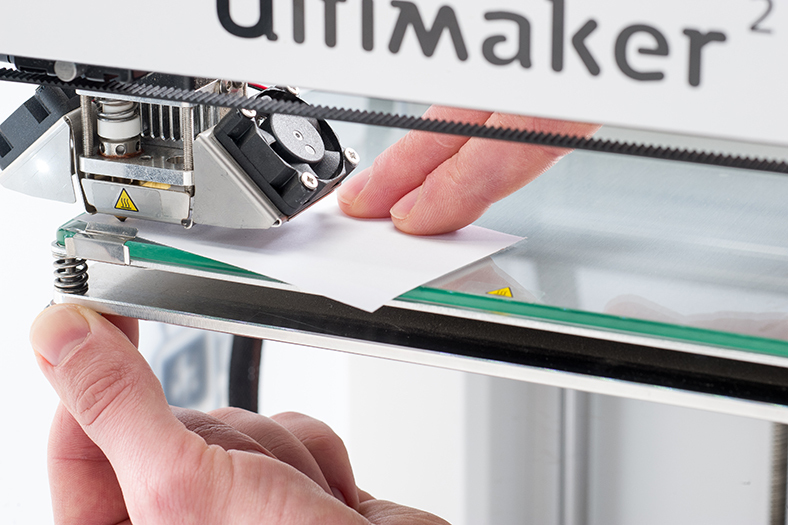 Un-boxing and following the initial instructions on-line or on the supplied card is fairly easy up until the point of feeding the filament. The instructions did not tell me what to do if the feed mechanism started making a continuous clicking noise. I get a bit frustrated if the instructions I am following are not complete. I had to phone the place I got the printer. The Creat3d support people were very helpful and patient several times during the afternoon. 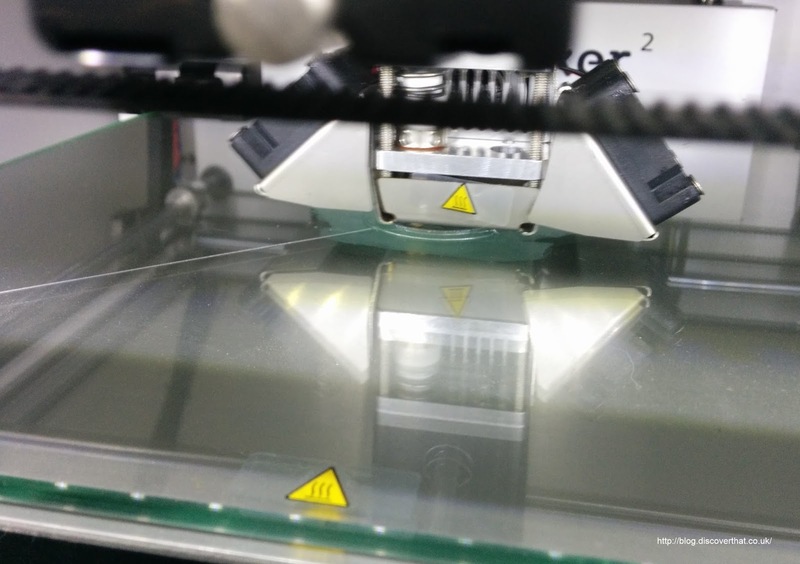 The initial filament feeding problems were caused by the end of the filament not been straight. TIP: The end of the filament on a new spool is likely to be bent to hold it on the spool. Cut off any bent or damaged filament and make sure the end is square cut. Anything that could get stuck on the sides of the Bowden tube will get stuck and cause the clicking sound and stalled progress that I experienced. It still takes a little pressure to push the end in to the feeder at the back but if it is excessive the filament will probably also get stuck elsewhere! TIP: Even with good clean filament I found that it was aided in the initial feed by holding the Bowden tube upright or in whatever position stopped the knocking sound. 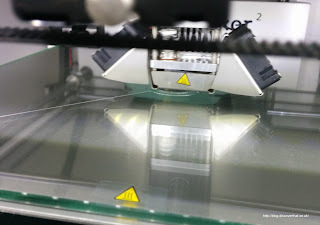 During printing the knocking sound happens from time to time and I guess it is a necessary part of ensuring that the pressure of the feed is equal to that needed to extrude it from the hot head. 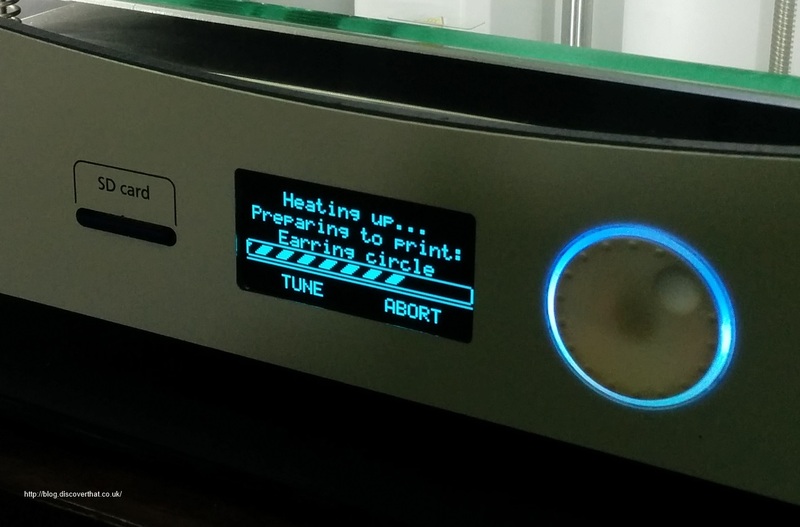 The next problem happened when I tried to print. I had followed the instructions for leveling the bed however I did not find their descriptions matched up to what I needed to do to get it to work. Again, this was with more help on the phone. 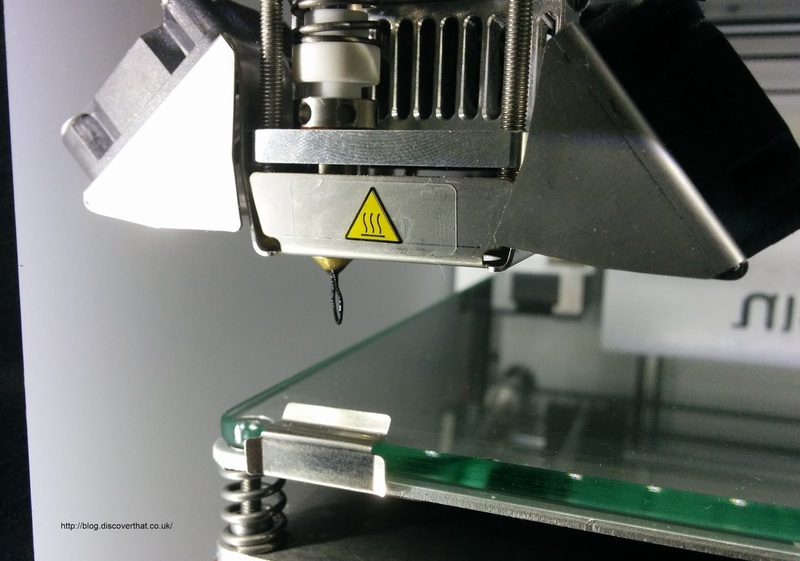 The first problem was that the factory test print had left plastic stuck on the nozzle. As I had never seen one before I did not know this. After calibration of the bed, unknown to me, the head was way too far away because of the extra plastic thickness. My print did not stick to the bed! Once hot I could see the extra plastic so had to abandon the print and clean the head. I used a handy box cutter to carefully lift away the excess plastic from the head. I then calibrated the bed again! For my next attempt, the filament extruded during the initial start-up of a print, that makes sure the extruder is working and dribbles plastic in the corner of the bed. All it did on the print was a fine goo that clogged round the head. More phone calls and the person suggested that the head was probably too close to the bed, preventing the plastic coming out! More bed leveling. Luckily it is a quick task. 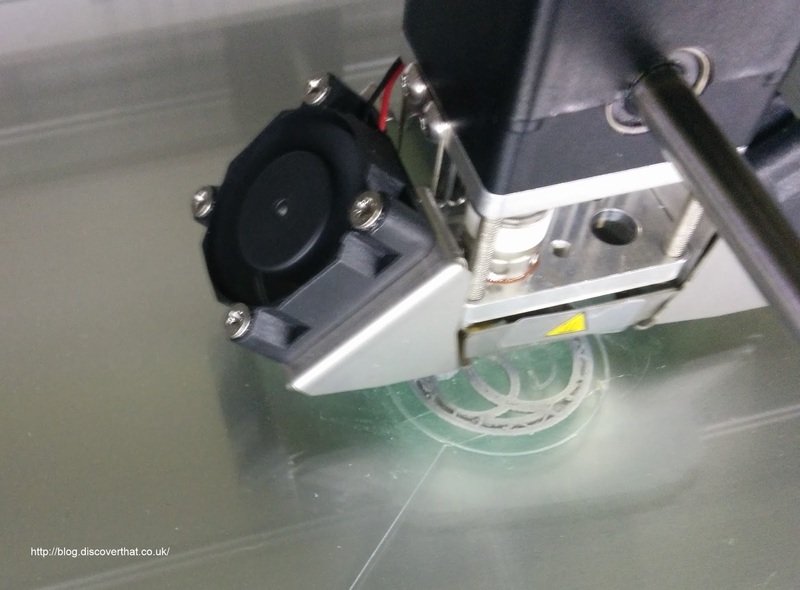 This is the time where I have to deviate from the Ultimaker instructions, or at least my description of 'slight friction' is different to theirs. MY WAY: Adjust the bed so the paper has slight friction and then loosen a tiny fraction so you can just feel the paper dragging on the head. This variation could be because my paper is a different thickness to their paper! We then proceeded to print a test earring that comes on the SD card with the printer. I selected this piece because it said it would only take 7 minutes. It took a fraction longer but still a quick thing as a test. Having had plenty of opportunity to play with the setting while setting it up I was impressed by how easy the menu was to use and to navigate. I have not needed to read anything to find the features I needed. Once I get over the initial frustrations everything else has been simple. 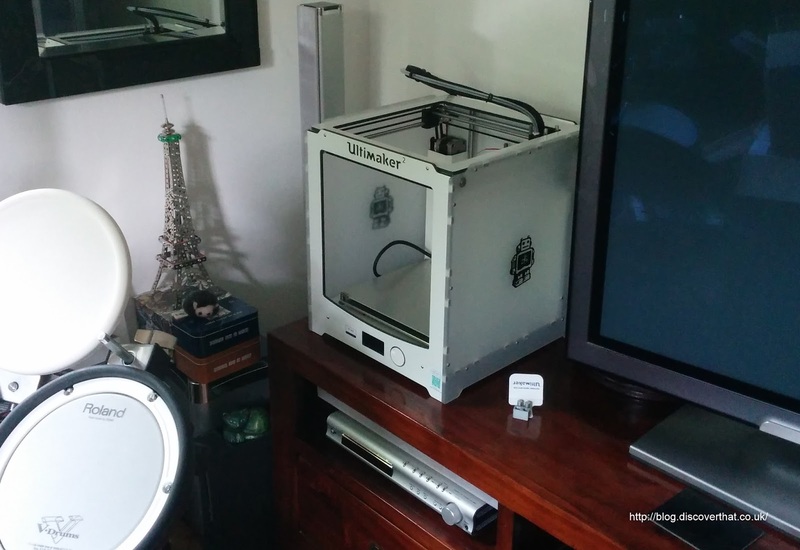 So far I am very pleased with the Ultimaker 2.